Motorcycle Mechanics Project 60 mph MB5! This is part 1 of a 4 part series in which Motorcycle Mechanics de-restrict an MB5 in an attempt to reach a "true" top speed of 60mph. 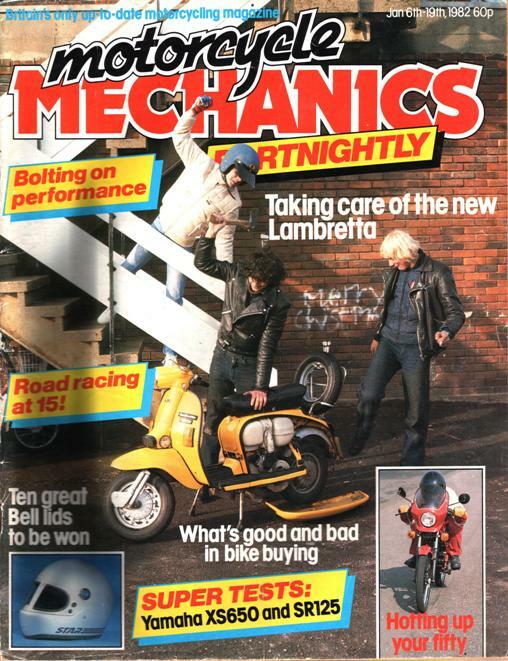 If you have ever ridden a restricted 50cc sports moped you'll know just how feeble they are. Honda's MB and MT50 models are no exception. Secret tuning details to turn these mouse motors into mini road rats were slipped under Brian Crichton's desk. Memorise and then swallow these pages. Displayed on these pages are authentic tuning secrets which originate from Honda for the MB and MT50 Honda's. if the next issue of this magazine doesn't appear you'll know we have all been shot for revealing them. 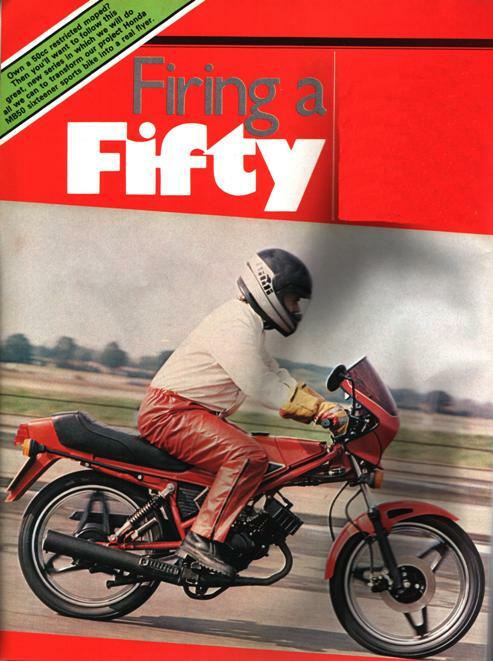 In addition to the Honda secrets we have a few ideas of our own and we now have our own MB50 on which to try them. We decided to buy the Honda because it has proved to be a poular buy in its road and trail forms. Also the road version which we have looks so sporty. It deserves to have a bit more power to its elbow. We have chosen to increase the performance of our MB50 and this story is the first of a series which will appear from time to time on improving the model. The first step is to re-register the machine as a motorcycle. To do this you have to be 17 or over. At 16 you cannot ride a restricted moped which has been performance modified. Even changing the gearing would be illegal. You will see from your log book that under the heading "Model/Type" the machine is registed as a moped. On the back of the log book are various sections to notify the authorities about various changes. 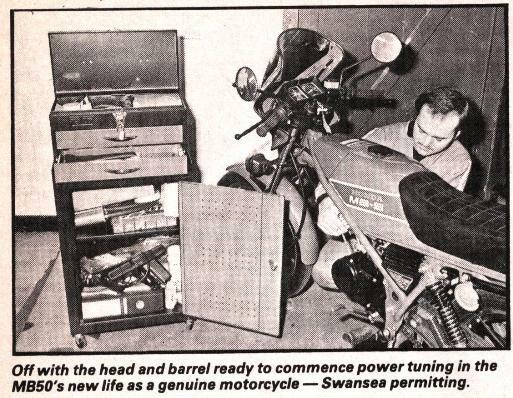 I couldn't see any headings which dealt directly with changing of type so I wrote a letter to DVLC, Swansea SA99 1AR explaining that I wanted to re-register the bike as a motorcycle because I was going to tune it. I included the log book so that necessary alterations could be made. Now its a question of waiting to see what happens. If you own a restricted moped you will have noticed that somewhere on the machine is a plate stating it is a moped and giving details of capacity, weight and showing the wording 30mph. if your restricted model doesn't have a plate for some reason then you are breaking the law if you are riding it while 16. On the Honda the "restricted plate" is riveted to the head stock on the right side. Once you have dealt with the paperwork you can get down to business of freeing yourself from the 30mph gutter riding by pepping the engine up. Instead of the usual way magazines have of giving you details in stages, we thought we would blow the gaff on Honda's tuning mods straight away so that you can get on with the job if you so wish. To what extent they work we cannot say because we haven't done them ourselves so far. It's our plan to use them as guildelines, combining them with ideas of our own. Diagram A: This shows that you have to raise the four transfer ports by 1.5mm and the exhaust ports by 5 to 7mm. 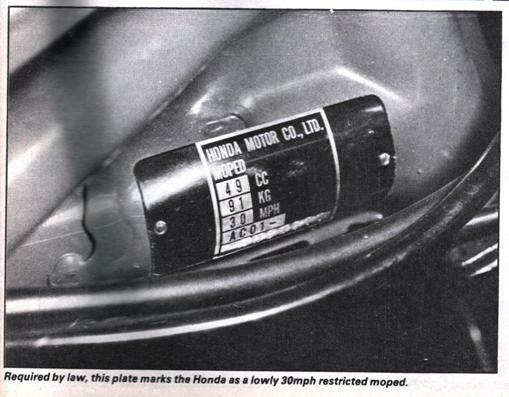 This figure for the exhaust is a colossal amount, indicated just how much the Honda is restricted by its porting. 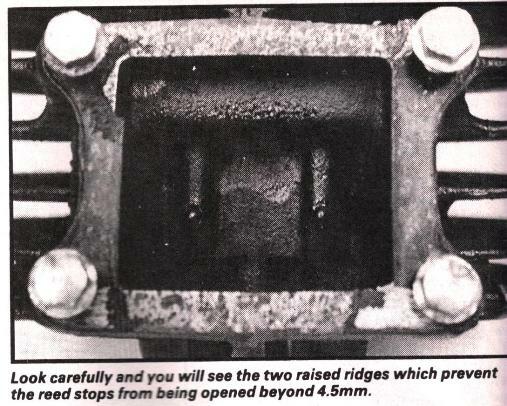 For instance, on an RD250 Yamaha it would not be advisable to raise the exhaust port by more than 2mm. to start with we intend to be cautious and will limit ourselves to 5mm extra exhaust port opening. We can always file away the other 2mm at a later date. Diagram B: Accompanying this one were the words "cut off and take the inner tube" in reference to the silencer. You'll have to work this one out for yourself for the time being since we have not investigated it. Diagram C: This shows the spark plug in the cylinder head. We are not quite sure where exactly you draw the top line to start the 10mm measurement for shaving the head to increase compression. Not to worry. We have heard a whisper about a company which is about to supply machined heads on an exchange basis for the MB/MT50. We'll give you details as soon as we have them. Meanwhile, if you have your cylinder head shaved the ignition timing will probably have to be retarded slightly. 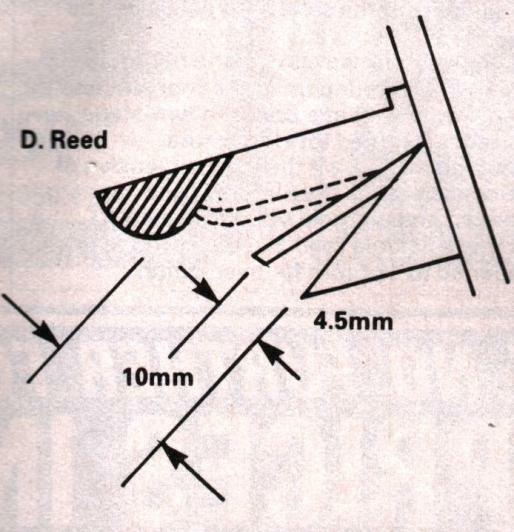 Diagram D: If you remove the reed block you will discover that the reed stops are only open 4.5mm. This is a severe intake restriction. Elsewhere in this issue is a feature on squeezing more power out of the Yamaha DT125MX which has its reed stops set at 8.5mm, almost twice as much as the Honda. The Honda stops cannot be opened any further unless the two raised ridges in the barrel intake are filed away. Honda say you can increase the stop gap to 10mm but the reliability of the steel reed petals will be reduced. Again we think we can go one better. We put Serval Marketing on to the problem and they discovered that a Boyesen two-stage fibre reed designed for Husqvarna scramblers will fit. It's the least expensive of the Boyesen range they import from America and will cost you £6.80 inc VAT. This more flexible reed allows the stops to be opened to 12.5mm for even better breathing. 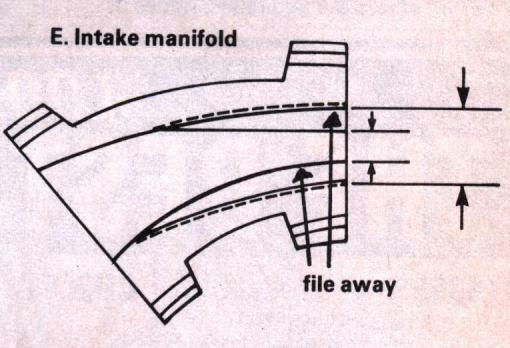 Diagram E: This gives a visual guide of how much to shave away from the inside of the intake manifold. We cannot give you exact measurements at this time. If you wish to make a start straight away, we suggest you tackle the exhaust port and reed valve restrictions first. That's what we intend to do. See you in part 2!